Hello! 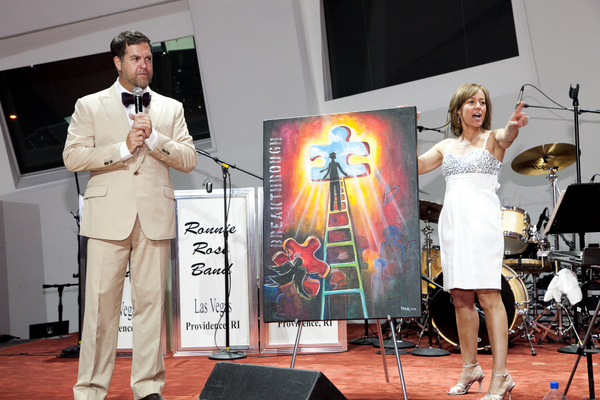 Here is a video we have put together of the painting completed for FEAT’s Autism’s Angels gala March 31st at the Lou Ruvo Center in Las Vegas. Thank you so much for allowing us to be a part of this great event and thank you to Brett Torino for the winning bid in the live auction. Hey there, it’s Jennifer! I thought it was about time to fill you in with some of the exciting new things that have been going on! First of all we are getting all settled into our new gallery space in downtown LA and we’re loving it! We have a 1600 sq foot loft space and is truly a dream come true. I’ve always imagined myself being in a space like this and to actually be here now is incredible! We are located in the Main Mercantile building at 620 s. Main St and 6th right on gallery row with a huge art walk that happens every second Thursday of the month bringing in around 30,000 art lovers! We’ve put A LOT of work into getting it all set up and can’t wait to show you pictures soon! That leads me to our exciting new Kickstarter Project! We only have a little more than 30 days left to meet our goal!!! Please check it out, I need your help! We learned about Kickstarter.com recently which is a hugely successful website for funding creative projects and we thought it would be perfect to help the gallery get launched to the next level. I have a lot of big new innovative plans for the gallery and ask that you watch our 3 minute video and consider making a pledge to support my dream! We must meet our goal to receive any of the funds! Our goal is $30,000 and we are just over half way there thanks to many of you! PLEASE consider supporting our project and sharing our story with others!!! In the video I will tell you all about it! PLUS, for each pledge you get a great piece of art which is the first painting I did in the LA studio so it’s a win win for everyone! The next big update is that my art is on permanent display at The Prestigious Smith Center for the Performing Arts in Las Vegas! 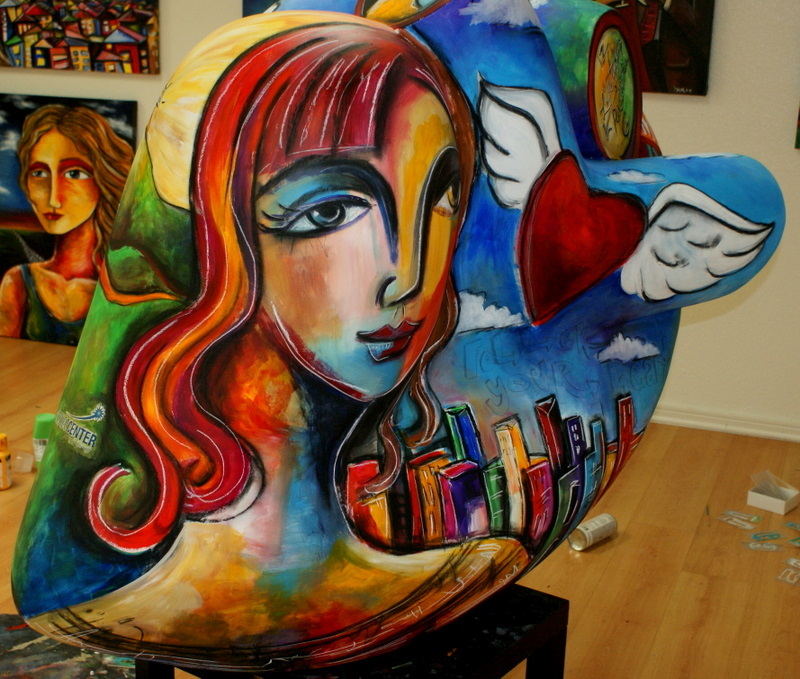 St. Jude Children’s Research Hospital has a wonderful new project where they have artists paint on 5 ft heart sculptures which are each sponsored for $20,000 or more with 100% to benefit St. Jude and then displayed at various locations throughout Las Vegas! The new collection of 2012 hearts were unveiled this past weekend at the press conference which was held at the Smith center. I was asked to speak along with Myron Martin who is the President and CEO of the Smith Center as my heart from last year was donated by the purchaser to be on permanent display. There was a ribbon cutting for the heart and we have some great photos and a news clip for you to see! Click here to see all the photos! To make it an even BIGGER afternoon I was able to see another piece of my art at the Smith Center that had been purchased for at a fundraiser auction to benefit Lied Children’s Discovery Museum. It is now on permanent display as well which is hanging proudly inside the beautiful Smith Center. President of the Smith Center showing me where my art was hung! 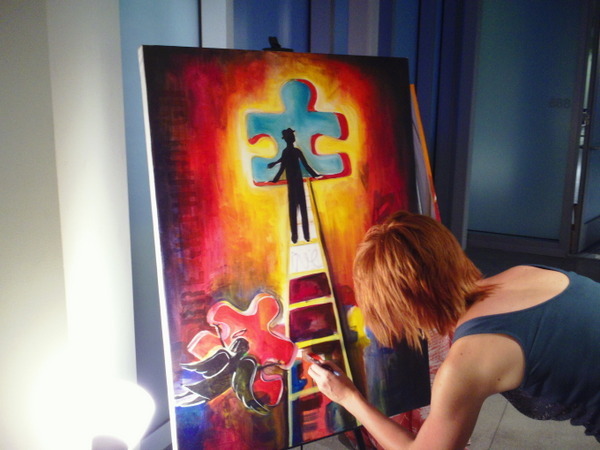 Live Painting at Autism Benefit! 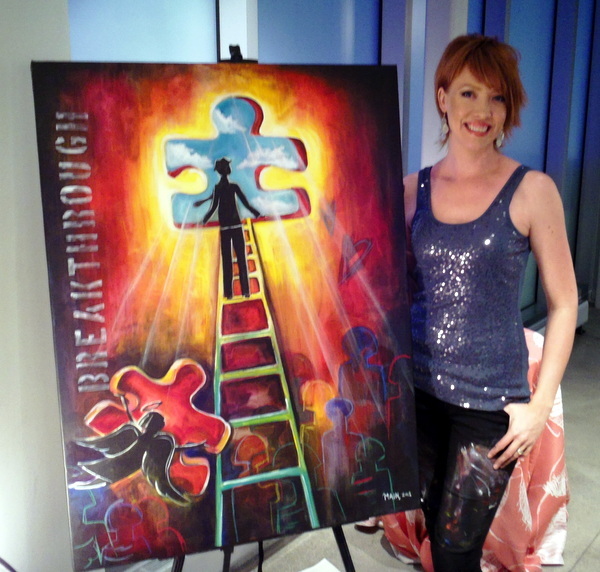 To top off the weekend I was invited to paint a live painting from scratch at “Autism Angels Gala” to beneift FEAT (families for effective autism treatment) which was held at the Lou Ruvo Center for Brain Health. It was auctioned off for $5,000 and it was a beautiful night for a great cause! See our photos here! We have some great events coming up that I would like to tell you about! May 5 & 6th Calabasas Fine Art Festival *I was selected as their featured artist!!!! I hope to see you at some of the upcoming events! See all our events here! Lastly, You may have noticed already but we have a brand new website! That’s it for now! We have an exciting year ahead and we’ll send out more updates from time to time but the best way to stay updated is by following me on Facebook! I hope to see you soon and please remember to watch the Kickstarter.com video! I was asked to speak at the St. Jude press conference this past Saturday. 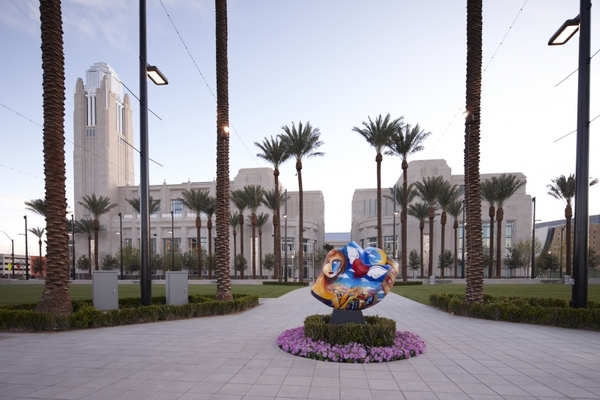 It was held at the pretigous Smith Center for the Performing Arts in Las Vegas where the new 2012 hearts that were created by local artist were unveiled and my heart from last year was dedicated to the Smith Center for permanent display! It was quite an honor! Here is news clip from channel 13. About a week and a half ago my husband and I packed up everything we own and shut the doors to our las Vegas gallery to take a big risk and move to downtown LA. About 6 months ago I had a strong desire to make southern California our new home. I have never lived anywhere else as an adult and have been craving some change. As much as I love my life in las Vegas I started to feel like it had all become too comfortable and familiar. I thrive on being challenged, pushed beyond my comfort zone and am driven by risk, by trying new things and LA was calling my name! My husband, Jason, was up for the move and we made the list of what we needed to do in order to make the move by the beginning of the year. We knew we would be in a much smaller space in CA so we sold and gave away almost all of our personal possessions. We sold our beloved bronco, a motorcycle, our nice couches, dining room set, bed, the big TV, and lots lots more! It felt great to lighten the load and hear the feedback from others. “don’t you want to keep it just in case? you gave THAT away?, are you a Buddhist now?, don’t you need a tv and somewhere to sit?”… And we did end up sitting on the floor of our living room for a month because the couch was the first thing that was picked up and I was thinking “wow! We’re really doing this!” it felt freeing, scary, and so exciting! It’s just stuff and there’s always more! Next, we had to find a new tenant for the house we were renting which took some time to get figured out and we decided to do it a couple of months before our move to LA so we wouldn’t need to worry about it over the holidays which meant moving into the gallery for 8 weeks. The gallery is plenty big but has no shower, laundry, or bed. We squeezed the personal possessions we had kept into the gallery and found a nearby laundromat. For showers we signed up for an unlimited hot yoga membership and every time we wanted to take a shower we would do a yoga class first….so we ended up doing LOTS of yoga and the showers were a great motivation to get us there. :-) For a bed we found a cool convertible couch bed type of thing that worked out well. It was a good experience and we enjoyed it (though I’m not sure I would want to do it long term). Our next project was to have a great holiday show at the gallery and lighten up our inventory of art. We had one of our best shows ever and had a great turn out. It was so much fun to see everyone from collectors, supporters, fans, family, and friends coming by throughout the night and we definitely lightened our ‘art load’ so I give a HUGE THANKS to all of you who came by and purchased art!!! After the show it was time to pack up the gallery and narrow down what would stay and what would go. On our move day we got all of our stuff to fit into our van and a 6×12 Uhaul trailer! That’s coming from an 1,800 sq ft house and an 1800 sg ft gallery. With moving out of the gallery and taking down the signs there was some sadness because I did love being in that space and all of the good memories, but I kept focused on how excited I am about being in califorina! I am ready to get on the road! We drove straight to south Pasadena where my grandma lives. She said we could stay with her until we found our loft in downtown la which works out great. So that’s where I am now, writing this blog out on her balcony with a beautiful view listening to all of the birds down below. Jason and I have been exploring la each day. Going on hikes, trying out the subway/metro system, looking for lofts, and just enjoying being in a new place. The exciting news is that we found a great loft already and we move in February 1st!!! It’s much bigger than we thought we would get at 1600 sg ft with a glass front so you can see in from the street on the second floor right on gallery row. We’re paying more than we originally wanted to but I think it will be worth it. 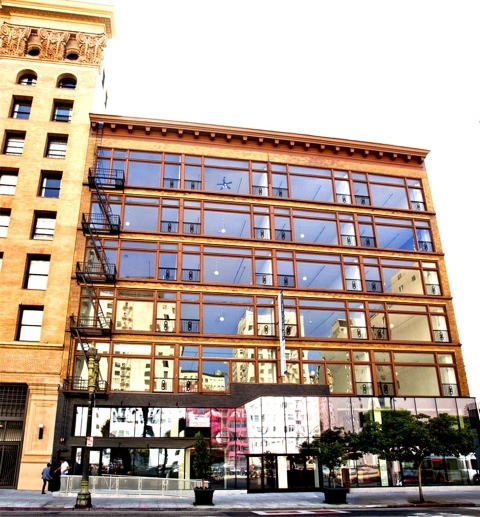 It’s in the Mercantile building @ 620 main street and 6th! It’s a great open space that will be perfect for the gallery. It’s really exactly what I had been envisioning. Plus it’s zoned for a live work space. you can check in and see what new painting I’m working on and you can chat in at the same time, you can also make a Skype appointment, and on the web store www.jennifermainshop.com each item will eventually have a video to watch. I thought it would be a good way to stay connected with you and give you a chance to be a part of the gallery no matter where you live! Of course I hope you can come see the new pace for yourself as well. I would love to see you and show you around!!! Well, I think that’s it for now. Wanted to share some of our journey with you and I’ll blog again when we get a little more set up in our new place. 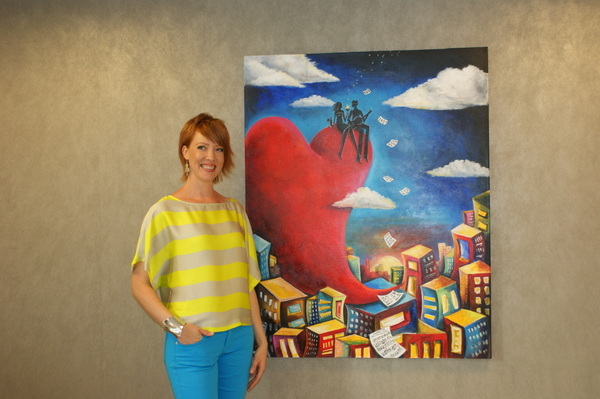 Local Artist Jennifer Main stops by to talk about Art in the Park. Click this link to watch now! Art in the Park this Weekend. Jennifer was honored to be the featured artist at the 49th annual Art In The Park in Boulder City this past weekend. The event was held October 1 and 2 from 9-5pm and brought out more than 100,00 people and all of the money raised from the event supports their local hospital which is privately funded! Pretty cool!! It’s held on their beautiful grassy green park gounds showing off a juried selection of artisans from around the country. Being the feautured artist was exciting because Jennifer’s work was on all of the show programs, t-shirts, and posters which were seen in every local business’ storefronts! It was quite a sight to see hundreds of volunteers and many others who were working at the show wear shirts that prominently displayed Jennifer’s painting called “The Piano Man” printed right on the front. She was presented with an award yesterday afternoon which she was proud to display at her booth. We will be sure to add some photos from the event very soon! I have always been a big believer in living life by following your heart….listening deep down to that inner voice that leads you into new things, new adventures, to make some changes. You may get a glimpse of what’s next and it brings you great joy and peace to envision it. To achieve this new desire often times presents challenges, obstacles, fearless faith, and determination to do whatever it takes to get there and I am always up for the challenge! Many big decisions in my life have been made this way and I’ve never been steered wrong. As I trust in God he reveals the steps I need to take next and I know I will never feel fulfilled unless I do. I will have this moment where what normally fulfills and excites me suddenly becomes dull, empty, and dies in a way. I then know it’s time to move on and I anxiously look for where my heart is pointing me next. About 5 months ago I was in Los Angeles with my husband. We were in need of a break from the daily routine and took a spontaneous drive headed south on I-15 deciding to stay in Hermosa Beach for a few days. We brought our bicycles in the back of our painted ‘hippie’ van and were ready to enjoy life and relax! …and we did….we road our bikes up and down the coast stopping to get some fresh seafood at the Redondo fish market (where we even tried some little steamed snails), walked through the sandy beaches and listened to the waves. 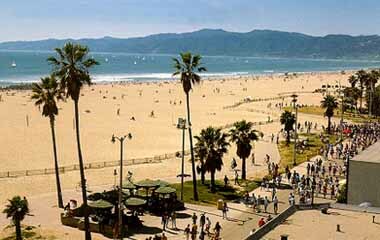 We walked through Venice Beach enjoying the eclectic mix of people. We explored Melrose on the bikes as well, has some great coffee and fresh juice at the very popular Urth Cafe and stopped by Kat Von Dee’s tattoo shop where she let me hold her new hairless cat and then came across the Melrose Trading Post where people sell all sorts of cool things. At night we stopped by some places with live music and enjoyed the cool California breeze as we road our bikes home. I felt energized being able to explore new streets, new shops, and new people. It was absolutely great and I didn’t want to go home yet. My husband’s best friend Chuck is a director in Studio City and he invited us to come by his place on the way back so we stopped by and he was getting ready to go to his Bikram yoga class. If you’re unfamiliar with this it’s a 90 minute class which is done at 105 degrees in 40% humidity! If you’re not used to this it’s intense!!! We were up for trying new things this weekend so we joined him. We made it through the ‘smelly torture chamber’ and felt great when we were done…funny thing is Kat Von Dee was walking in when were walking out…did she think we were stalking her? (as a side note we have now become big fans of hot yoga and have started going almost every day in Vegas) After a cold smoothie and a quick dip in Chuck’s jacuzzi we were ready to continue our adventure. He persuaded us to stay at his place for the night so we could have more time so we did. We walked over to the metro which I thought was way cool to have available and took it over to Hollywood Blvd where we checked out some of the more touristy stuff then went to a cool unique independent burger place for dinner. (I forget the name) I’m thinking this is great! I can eat at a place that isn’t a chain, has quality food, a unique atmosphere, there’s no gambling, and I didn’t have to drive to get here!!! I guess the simple things make me happy! Walking home that night from the metro station I thought this really feels like it could be home and that started the little wheels in my head a turnin’. Jason, my husband, has always been a big fan of California as well (he’s originally a Tennessee guy) and we all talked about if it would be possible to move to California some day. We just signed a 2 year lease on our Vegas house so I thought it could possibly work out in a couple of years. Jason says the lease isn’t a big deal, we can work something out and with that my mind and my heart already had us moved. Let’s get moving!!!! NOW! On our way home to Vegas we talked more about this idea of moving to California and how soon it could happen. I was sooooo excited!! I felt newly alive and ready to do whatever is takes. I know I personally need a new challenge such as learning the ins and outs of another city. To have new opportunities as an artist as well as new inspiration. I grew up in Vegas, am 30 years old and have never lived anywhere else so I’m craving some change! We decided that there are some art shows and things with family and his work that needed to be finished up, but that we could be ready to move and have a big moving away holiday party in December, then we would be off to our new adventures in LA at the start of 2012. ….and so that’s what we’ve decided to do! Follow our hearts and make the changes necessary to get there. What is the plan??? Our landlord is allowing us to rent our house, we told our family and they are happy for us though they’re sad we’re moving away, we are planning to find a live/work loft smack dab in the middle of downtown LA. We won’t have much space so we have already begun to sell and give away almost all we own, but the lofts are VERY cool and is the type of place I’ve always dreamt of living in! 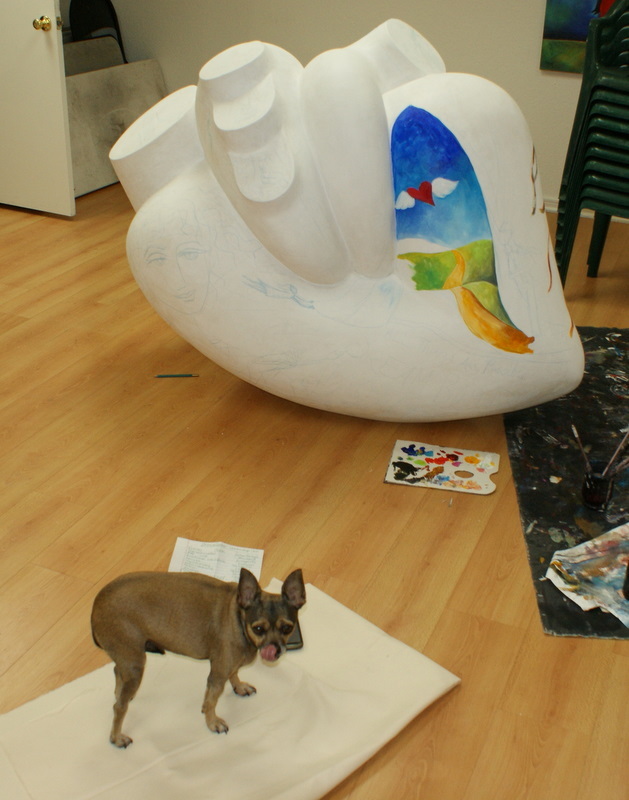 It will be setup mainly as a gallery and studio which will be open for you to visit and shop!!! We will still be in Vegas often for all the art shows and to see family and friends!!! Being in California will make it possible to branch out into new areas with my artwork and Jason is now available to work full-time with me which is awesome!! It’s just time to grow, try some new things and everything seems to be falling into place. Yes, it’s a little scary, quite risky, and expensive, but exactly what we want and in the midst of the changes I feel deep peace that we’re doing the right thing. With that being said we invite you to come celebrate with us at the gallery December 10 in Las Vegas. We would love to see you and thank you for all of your support before we head on. (Of course we are only moving, we won’t be strangers!) I will have new work on display and Jason will be showing a collection of his paintings for the first time. Please save the date, it’s going to be great night! We will send out an invitation with all the details as the time gets closer. I hope that you will visit us in LA and continue to follow and support my work. It’s because of you that I am able to continue to live out my dream and I thank you greatly for the art you’ve purchased over the years and for taking time to attend my shows and events. I am forever grateful! So here’s to following your heart and doing whatever it takes to do so! What’s New in the Main World? 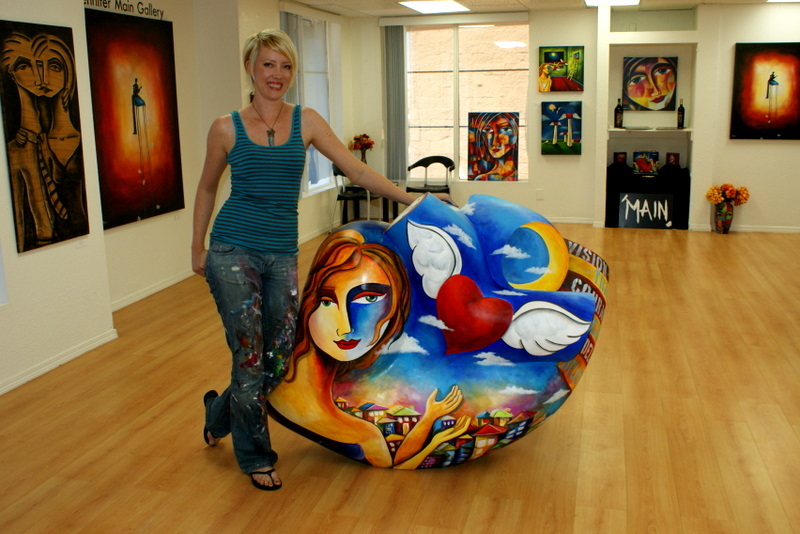 Recently I was selected to paint a couple of large heart sculptures to raise money for St. Jude Children’s Research Hospital. 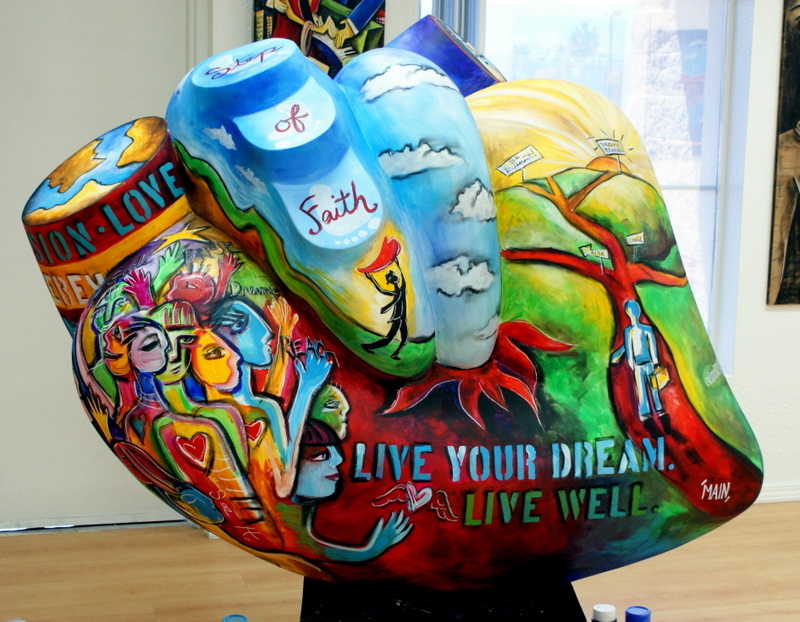 Each heart was purchased for $20,000 and one was put up for auction and raised an additional $20,000. I love what art can do! Read below to see what’s coming up! This brand new article just came out in Soreal Magazine Click the image on the left to read it! I was asked a variety of questions on all sorts of things…hope you take a moment to check it out! Another update is that MJ Christensen Diamonds now carries my work at both of their beautiful stores in Summerlin and Henderson. 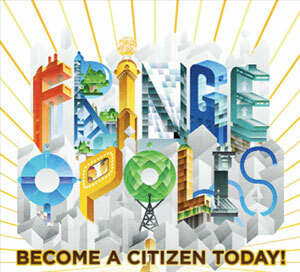 I am so excited to have it there and think it will be convenient to have artwork available in other parts of town. They even have the popular hand-made prints that are great for unique gifts along with their large selection of jewelry. I hope you stop in and check it out! We (my husband Jason and I) are looking forward to showing at the Fringe International Theatre Festival in Edmonton, Alberta again this year! Last year we had a blast and can’t wait to be a part of it again! It was one of our best shows! The show runs from August 11-22 and brings in over 550,000 people from all over the world. 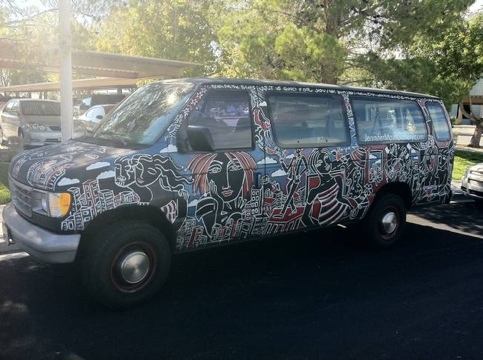 We will be packing our big painted van to the brim and heading that way the beginning of August. Last year we got to stop off at Yellowstone and Jackson Hole which was beautiful. We’ll see what happens this trip. We’ll have our 2 chihuahuas (Pixel and Lautrec) along for the ride this time as well. We’ll have to remember to get them their doggie passports! LOL! I hope you can join me for this upcoming event because I think it’s going to be a ton of fun! There will be music, local artists, and some of Vegas’ most popular tasty food trucks. It’s located on Windmill between Rainbow and Buffalo. Click on the image above to see all the information you need! The event is free to attend and if you would like to see the GUNGOR concert tickets are $10. I hope you’ll join us! If you haven’t had a chance to check out our new on-line store please take a moment to check it out and save 15% when you enter coupon code ILUVART It’s still under construction, but it has some great new features the old site did not have and it should make shopping on-line much more convenient. I now have fun new items like purses, business card holders, and mouse pads! I was so excited to find out that I was selected to be the featured artist at this year’s Art In The Park show October 1 &2! It is their 49th year and brings in over 100,000 people each year. Come enjoy a nice afternoon seeing 100’s of unique artists. I will be at booth #179 and as the featured artist a selected image will be on all of their t-shirts, posters, and promotional material. Can’t wait to see it! Save the date!